Vegas NCAAF Odds Alabama vs Arkansas 2010 College Football Picks - This is going to be the College Football Picks Week 4 Game Of The Week, this is a big SEC conference match-up between the #1 University of Alabama Crimson Tide and the #10 University of Arkansas Razorbacks. Las Vegas NCAAF odds have placed the Crimson Tide as a 7-point favorite going on the road. #1 Alabama is 3-0 and have not really been tested with there College Football Picks wins against San Jose State (48-3), Penn State (24-3), and Duke (62-13). Only Penn State represented a true challenge and, with a freshman quarterback leading the team into a hostile environment, even that was not a competitive game. This Saturday’s SEC Picks showdown will be a competitive game. #10 Arkansas(3-0) has been tested this season with NCAA Football Picks wins against Tennessee Tech, Louisiana-Monroe, and, last week, 31-24 College Football Predictions victory against the University of Georgia. 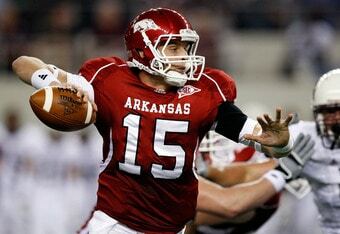 Quarterback Ryan Mallett, a Heisman hopeful, led the way against the Bulldogs with three touchdowns and 380 yards passing. Seven different receivers caught passes, including junior receiver Joe Adams, who caught 6 balls for 130 yards. Mallett likes to spread the ball around, and look for plays all over the field. Mallett was clutch too, winning the game in the final seconds, after the defense blew a 14-point lead in the fourth quarter as Georgia rang-up 392 yards in total offense. 25% Sign up Bonus up to $250 On this College Football Predictions Game Week 4. The Crimson Tide, with 2009 Heisman winner Mark Ingram and Trent Richardson, will give the Razorback defense all they can handle and more. Alabama would like to keep Mallett off the field, meaning lots of yardage on the ground from their running attack. Quarterback Greg McElroy will also test the Arkansas defense with a passing attack led by junior receivers Julio Jones and Darius Hanks. Alabama’s defense has been an immovable object thus far and this game will boil down to the Crimson Tide defense vs. Mallett’s passing game. Can Mallett impose his will against the Crimson Tide’s pass defense? The answer will go a long way in determining the winner of this game. Look for Alabama to make a statement in this College Football Picks game but Mallett will keep the game close and possibly beat the Las Vegas odds. Looking at the College Football Odds for the total in this Alabama vs Arkansas Week 4 Matchup Sportsbook.com have listed 56 points. You can also get Arkansas +7½-110 home underdogs. You might need that extra ½ point.